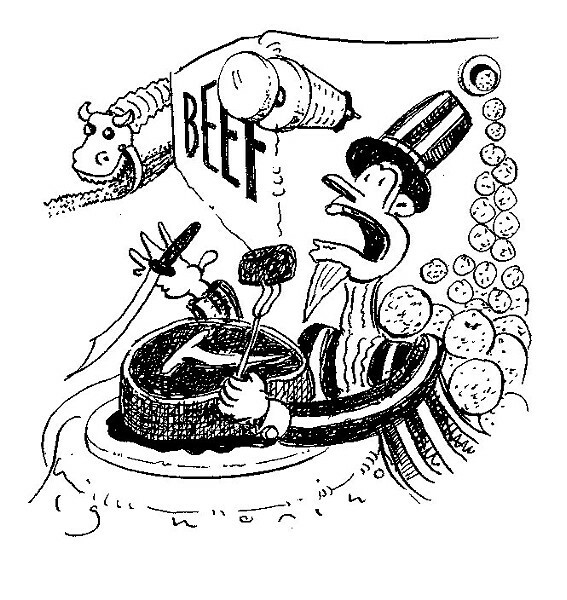 Sanctimonious vegetarians cite sordid tales of factory farms as evidence of the wickedness of meat-eating, and I concede cutting out meat entirely makes a certain amount of sense. Compared to vegetables and grains, factory-farmed meat is an inefficient food-energy delivery system. Producing a pound of beef is dozens of times more resource-intensive than producing a pound of whole-grain bread, but the calorie payoff for the bread is somewhat greater. There's plenty of evidence that as long as you get the right mix of nutrients, you'll live longer if you limit yourself to veggies: Coronary heart risk is reduced by 20 percent, as are colon cancer and type 2 diabetes. So, theoretically, there's no reason you couldn't feed all Americans, plus the rest of the world, on things that didn't used to have eyeballs. But all this has already been said, or rather shouted at you, by Greenpeace volunteers while you try desperately to get by them on the sidewalk without making eye contact. And it all misses the point. First, humans have been eating meat for roughly a bajillion years. As explained here some time back, we've spent eons evolving the teeth and the intestinal system needed to digest dead animals as well as celery. And experience suggests that as people attain the wherewithal to eat more meat, they take full advantage: In China, most notably, meat consumption has gone up 165 percent since 1990. All the yoga teachers in the world are unlikely to convince any significant chunk of the population to give it up. Second, while the cruelty of factory farming evokes a particularly visceral reaction—all that documentary footage of unnaturally buxom poultry crowded into tiny cages is tough to dismiss—serious negative environmental impact is characteristic of Big Agriculture overall. The question really isn't the merits of factory-farmed meat, but industrialized agriculture generally. From a purely economic standpoint, there's no disputing that both meat and vegetables have become exponentially more abundant in the developed world, thanks to technological advances. U.S. agriculture in particular has become the most productive in the world due to farm consolidation, mechanization and industrial techniques like factory farms. In 1960, the average American farmer fed 26 people; now it's something more like 150. Consider our friend, the hog. In 1978, factory farms accounted for 34 percent of hog production; by 1997, this had increased to 89 percent. Over roughly the same period, wholesale pork prices decreased 39 percent (retail pork prices decreased only 15 percent—somebody took the opportunity to get fat here, but it wasn't the farmers). The same was true of other U.S. farm products. The wholesale price of beef decreased 53 percent, the retail price 39 percent. Fruit, vegetable, and cereal wholesale prices decreased between 4 percent (navel oranges) and 62 percent (corn). In contrast, according to the food price index maintained by the U.N.'s Food and Agriculture Organization, world food prices overall have gone up. World Bank data suggests global food prices were essentially flat (in inflation-adjusted terms) from 1985 to 2005, but have risen sharply since then. Today, U.S. consumers spend a smaller percentage of their disposable income on food consumed at home than anyone else in the world. So, let's be clear: From an economic standpoint, industrialized farming of meat and vegetables has been incredibly successful at feeding people. But there are also plenty of costs that aren't factored into those prices. As the industry has shifted from family farms to large enterprises, livestock wastes have become more geographically concentrated and threaten air and water resources. Factory farms pump livestock with antibiotics to prevent the spread of disease among thousands of close-quartered animals, possibly contributing to increased pathogen resistance among animals and humans alike. Jumbo agriculture can lead to increased soil erosion, clogging waterways and contributing to flooding and contaminated water supplies. As anyone who skimmed through Silent Spring in college to impress a girl can tell you, runoff can also contain chemicals from pesticides, herbicides, and fertilizers that are harmful to the environment and to us. But these are negative externalities we'll have to reckon with later—they don't factor into the price we pay now. In practical terms, it's hard to see how we could sustain current American meat consumption (annual per-person estimates range from 175 to 260 pounds) without cramming the animals in cages. If 1955 beef production practices were used today, we'd need 165 million more acres of land to produce the same output. It may mean our grandchildren will succumb to antibiotic-resistant whooping cough, but the idea that we can feed a crowded world with a bunch of cows chewing cud on a hillside is juvenile romanticism.